Whittle Shortline Railroad 20% off! | More Crunchy Beach Mama! 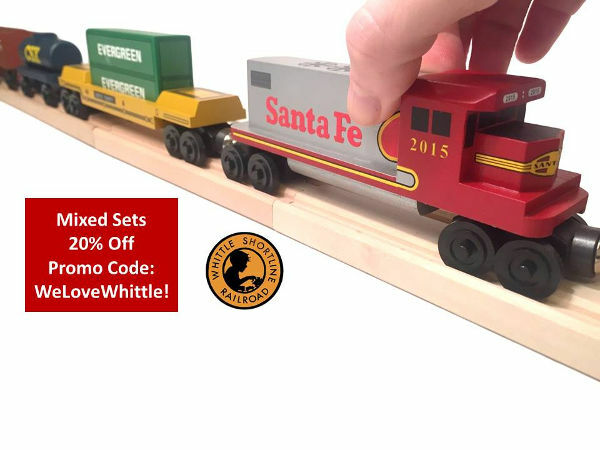 Whittle Shortline Railroad 20% off! November is here! I told my kids the other day that they needed to start making their Christmas lists. I totally know what one item will be on P’Diddy’s list – train stuff! The Whittle Shortline Railroad is a family owned, 20 year old, wooden toy train company. They hand craft realistic toy trains that are compatible with Thomas, Brio and Chuggington. Their toy trains are modeled after real trains you would see in your neighborhood. As a part of their 20th anniversary they released over 20 new trains in August of this year. In December they will begin a program of releasing a new train each month and expanding our offering to trains around the world! Visit their website right now to watch videos and learn more! My Readers receive 20% Off High Quality MIXED 5 Car Diesel Engine Toy Train Sets til Dec.11th! Enter Promo Code: WeLoveWhittle! in comments section at checkout at WoodenTrain.com. Will your kids have Trains as part of their holiday list? Watch for Whittle Shortline Railroad to be a part of my Kids Holiday Gift Guide this month! I partnered with US Family Guide and Whittle Shortline Railroad for this post.